location of an object or helps find an object from its location. It acts as a visualization aid that can demonstrat in a hands on way the visualization of how celestial objects are mapped using celestial coordinates common in any star atlas. It's my own invention of an 'Old Skewl' approach invented prior to mobile device. An updated re-invention of this device using a cell phone app will be announced on the official AstroSpotter WebPage by end of 2017. PicMapTool is a Java application that makes use of a 'transparent' window to view, measure and/or capture desktop windows below PicMapTool. It is handy for astronomical charts as well as terrestrial maps and pictures of all sorts. PicMapTool is placed over a picture, map, or chart and then calibrated line measurements of distance and even position angle. A variable size grid is easily enabled too. It also can capture the image below and then mix and/or resize or rotate the captured image all while mixing with the image below. CNET and Tucows or Mark-Toys.com. AstroQuery was written in Java so should work on PCs, Linux or MAC. AstroQuery allows me to find my observations on objects that I have entered into my spreadsheet of observations. AstroQuery now supports easy to form 'Tab separated value' format that is common for most spreadsheets so AstroQuery can also be used for quick lookup from object references such as NGC or any other list from spreadsheet. AstroQuery can show 1 object per line in Summary mode or show details of many fields per object. Below is a screenshot showing the 'Summary' one-line mode. If your observations are in a spreadsheet OR you have lists of objects in spreadsheets this can be a valuable tool in the field or at home as you plan or write up any observing report or OR as they are called. AstroQuery is invaluable to me as my memory is flat out not capabile of recalling my 4000+ observations. AstroQuery is very fast as it keeps the list read at the start in memory without having to load a spreadsheet and suffer the awkward and often slow queries. AstroQuery has intuitive query fields so no complex spreadsheet queries need be written. As of May 2014 since I now support tab separated formats I have been converting spreadsheets of common and very valuable reference tables and lists such as NGC objects and DeepMap 600 object list. I am not sure if I can give those out but the point here is that if you have a spreadsheet with objects in it is now a 5 minute process to form a tab separated file as long as the first row has special keywords that I need to understand what is in what column. The columns do not have to be in this order but here are the keywords for columns. 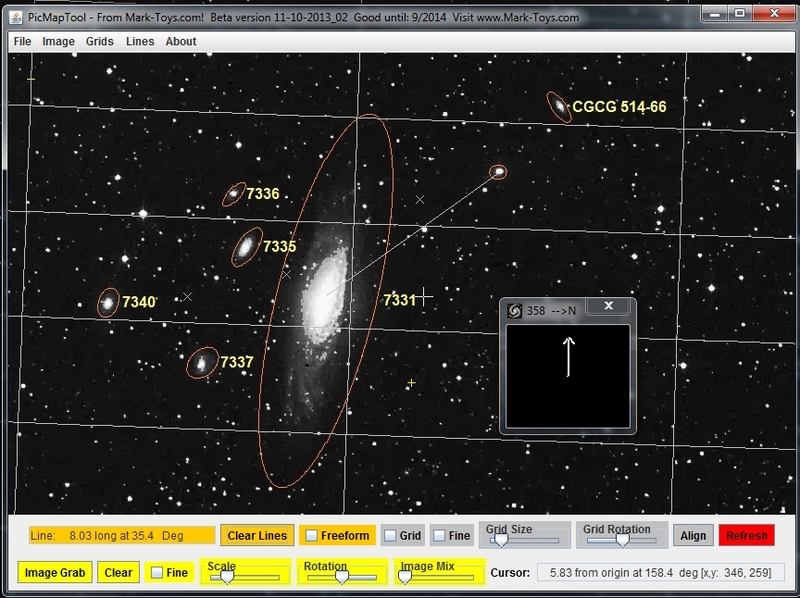 The tool allows me to ask for objects 'near' a particular object or RA/Dec coordinate and can filter what is found (or filter for all my observations) based on a given catalog like Sh2 or Pal or more commonly NGC or M. I can find what Ngc objects I have observations for that are in Cygnus for example or what observations have some text in my description which I often put 'common names' in like 'Ring Nebula' and so on. There is no manual yet so the formation of databases requires you talk to me for tips at this time.